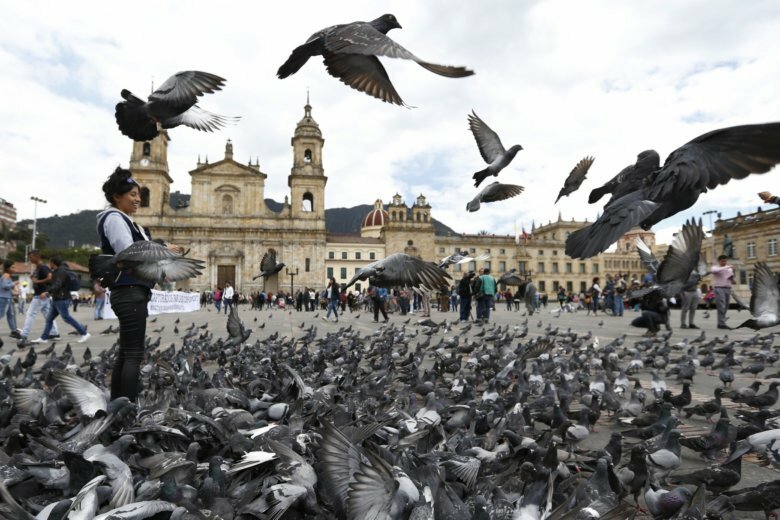 BOGOTA, Colombia (AP) — On a bright Sunday afternoon, a group of government workers walked around Bogota’s most famous square dressed as pigeons, with cardboard beaks covering their noses, as thousands of real birds swarmed overhead and left their droppings on stately monuments. Flapping their plastic wings and performing brief skits, they urged curious pedestrians not to feed the large flocks that descend each day onto Plaza Bolivar, a grand colonial era square flanked by a Roman Catholic cathedral and Colombia’s elegant congressional building. While London has tried to scare unruly pigeons away from train stations by deploying menacing hawks, and Paris has employed contraceptive methods to limit flock sizes, Bogota’s government is trying to fight pigeon overpopulation through educational campaigns that urge people not to feed them. Officials believe that if people stop nourishing the birds, they will stop concentrating in public squares where their droppings sully historical buildings and put people’s health at risk. If the birds, which aren’t native to Colombia, don’t gather in large numbers their rate of reproduction is also likely to decrease. A study conducted by city biologists found that the square’s pigeon population doubles on weekends to 3,400 birds as the number of tourists who visit the square’s iconic sites also swells. “In some areas (of the plaza) you can find up to 33 pigeons per square meter,” Cano said. But convincing people not to give the birds food has proven tricky. Feeding pigeons corn and taking a photo with them in Bolivar Square has been something of a local tradition for decades. It also sustains a dozen or so street vendors who sell small bags of pigeon feed for about $1 each. Bogota’s government is offering vendors like Portilla stalls in public buildings, so that they can sell snacks to office workers, instead of pigeon feed to tourists. It’s also offering job skills training children of vendors so that they have options other than following their parents into the business. But some vendors say they haven’t been included in the job placement program. And others are not convinced that selling snacks to humans will be as profitable as their current job. Officials said they will eventually ban pigeon feed vendors from the square if they don’t go voluntarily. AP Writer Cesar Garcia contributed to this report.